The advent of radio in the mid-19th century gave rise to a new wave of communication technologies. Pioneers such as Michael Faraday, Heinrich Hertz and Guglielmo Marconi contributed to advances in radio science that are still utilized today. As the commercial application of radio technology expanded over time, radio broadcasts by amateur operators (i.e. "hams") also increased. Today, ham radio broadcasting is still a popular hobby. Thousands of people across the world set up small broadcasting stations and start transmitting in the hopes of contacting other hams. With advances in digital technology, beginner hams have a steep learning curve to overcome. This can make purchasing a ham radio a difficult decision for anyone new to this hobby. Those who are shopping for a ham radio should first know about the different types of ham radios, ham radio components, and how to buy ham radios on eBay. In the 21st century, amateur radio operators have managed to transition the old, time-tested ham radio traditions into the digital realm. Modern handheld radios, for example, now contain more functionality than ever before, including the ability to broadcast across multiple bands and across longer distances. Thousands of longstanding ham radio stations are now online 24x7, no longer restricted by atmospheric conditions or local infrastructure. The realm of amateur radio is continually expanding as equipment manufacturers release new complex products demanded by the ham radio community. Today, there are four basic types of ham radios. These include base or fixed-station radios, portable radios, mobile radios and handheld radios. Fixed-station ham radios are intended to be set up permanently in one location and give operators the freedom to set up the equipment in a variety of ways. The only restrictions are price and expertise. Portable ham radios are a lightweight, easy-to-transport version of a high-powered fixed radio station.They are designed for temporary set-up in tight spaces with limited power supply and offer few customization options since the interface of these devices is purposely sparse. Mobile ham radios are intended for vehicles such as long-haul trucks. Handheld ham radios have limited operating capability compared to other types of ham radios, but they are the only kind that can be carried easily while in use. Ham radio stations are completely customizable. Beginner amateur radio operators would do well to start with a simple "rig" before adding miscellaneous equipment to their operating stations. Simply stated, there are three basic primary components of any ham radio station: antennas, transmitters, and receivers. Other ham radio equipment such as graphic equalizers, computer interfaces, and antenna tuners are not necessary for beginner ham radio operators to start broadcasting. A simple set-up is usually preferable for novices. Here are the basics on ham radio components. Antennas are arguably the most important component of any fixed ham radio station. Without a properly installed antenna, amateur radio operators will not be able to interact with other ham operators very well, especially across long distances which require a high antenna gain. There are two basic types of antennas: omnidirectional and directional. Omnidirectional antennas radiate in all directions, but directional antennas focus only in one direction, neglecting the other three cardinal directions in favor of a focused gain. Older antenna models are a good example of directional antennas. Within these two broad antenna categories, beginner ham radio operators can find many different variations of fixed antennas such as ground-plane, collinear and J-pole units. Below is a brief overview of the different types of handheld, mobile, and fixed radio antennas. While there are other antenna types, these are the basic styles commonly used by hams. Receivers and transmitters, likewise, have many different variations. The first receivers and transmitters were very large and heavy devices, but today, receivers and transmitters are small enough to carry. 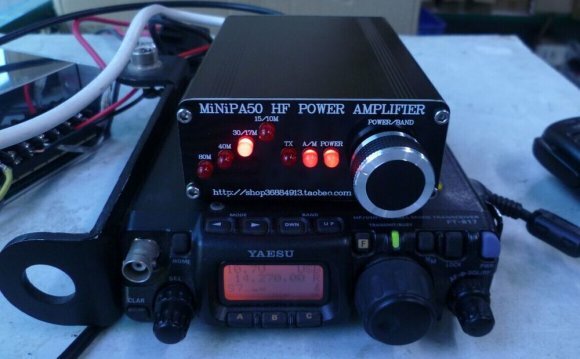 Expert ham radio operators may prefer to connect separate receivers and transmitters, but more often than not, amateur radio operators opt for a transceiver, a device which combines both a receiver and transmitter into a single unit. The biggest advantage of using a transceiver is simplicity. In fact, transceivers have become so widely used that ham radio operators now consider these devices standard. Obtaining a transceiver with the ability to transmit along HF, UHF, and VHF bands is critical in order to start broadcasting and receiving signals. The beauty of ham radio broadcasting is the ability to create a customized home radio station. The sheer number of different ham radio devices allows beginner amateur radio operators a world of possibilities. After building a basic ham radio station, beginners can begin to add other equipment to achieve a stronger more reliable signal. For instance, different antennas operate more efficiently during certain parts of the day. Even the position of the antenna can affect the quality of a radio signal, transmitted or received. When there is only a weak signal, an amplifier can strengthen the signal to broadcast further. There is nothing more exciting in ham radio that contacting another ham for the first time, once the signal is strong enough. Plenty International is an environmental, humanitarian aid and human rights organization based in Summertown, Tennessee, USA.